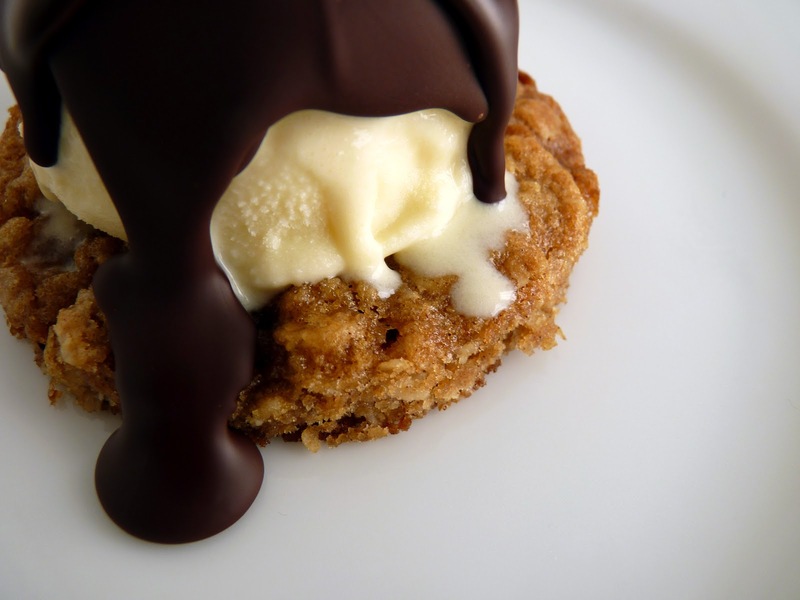 Who doesn’t love ice cream, cookies and chocolate sauce? A familiar dessert any time of the year, there are endless combinations and fascinations to try. What I love about making ice cream is you can really have fun with flavors and textures and in combination with your favorite cookie and topping, the sky’s the limit. 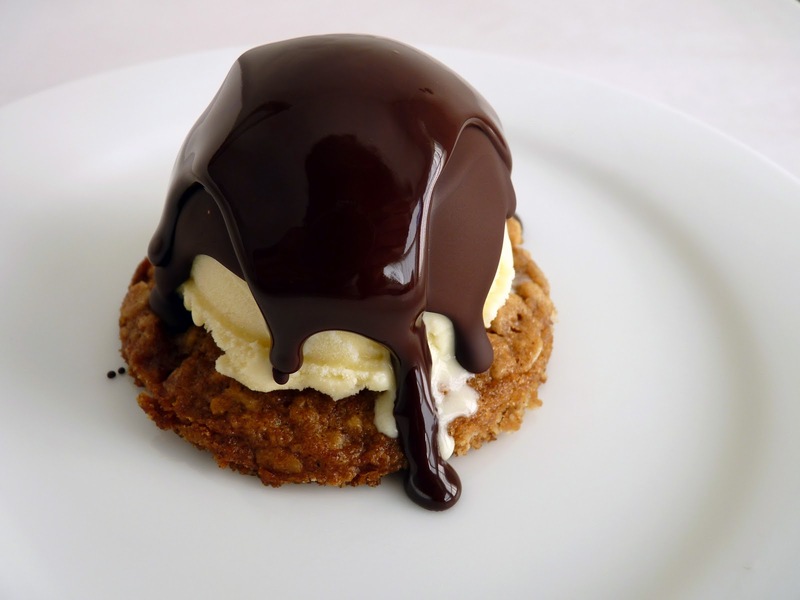 This particular ice cream “sandwich” was inspired by a delicious treat created in San Francisco in 1928 called IT’S-IT - a very basic but invariably delicious composition of vanilla ice cream sandwiched between two oatmeal cookies and dipped in dark chocolate. Here I keep the presentation simple by just topping one cookie with ice cream and a double pour of bittersweet chocolate. 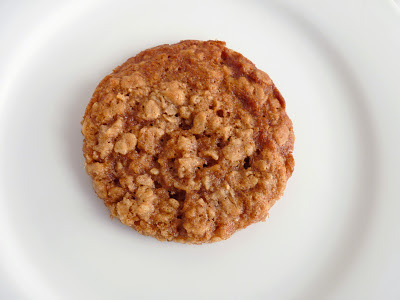 The cookie is made from a basic Quaker Oats recipe. The ice cream is from David Lebovitz. - Choose a cookie that is soft and chewy so it’s easier to eat with a spoon. - I use a large scoop (about 2 1/4" diameter) to portion the cookie dough, which yields about a dozen cookies. For a more polished presentation, I used a sturdy glass with a 3” diameter to press out uniform shapes once the cookies cooled. - I doubled the salt in the cookie because I like the contrast with the rest of the components. You can also sprinkle a tiny bit of coarse salt on top of the chocolate shell before it hardens for a different salty effect. - I’ve given the Quaker Oats instructions for the cookies, but I like to chill the cookie dough for several hours so the cookies hold their shape better when baking. - My ice cream formulations tend to be leaner, using less sugar, less cream and fewer egg yolks. For this vanilla ice cream, I use 1/2 C sugar + 2 T sugar, 1 1/2 cups of milk, 1 1/2 cups of heavy cream and 4 egg yolks. The final product is not quite as rich and creamy as David’s but it’s still very delicious. - For the hard chocolate shell, I use 1 oz of chocolate + 3/4 teaspoon oil per serving (coconut oil is ideal but canola oil works just fine). This forms a hard shell once poured onto the ice cream. 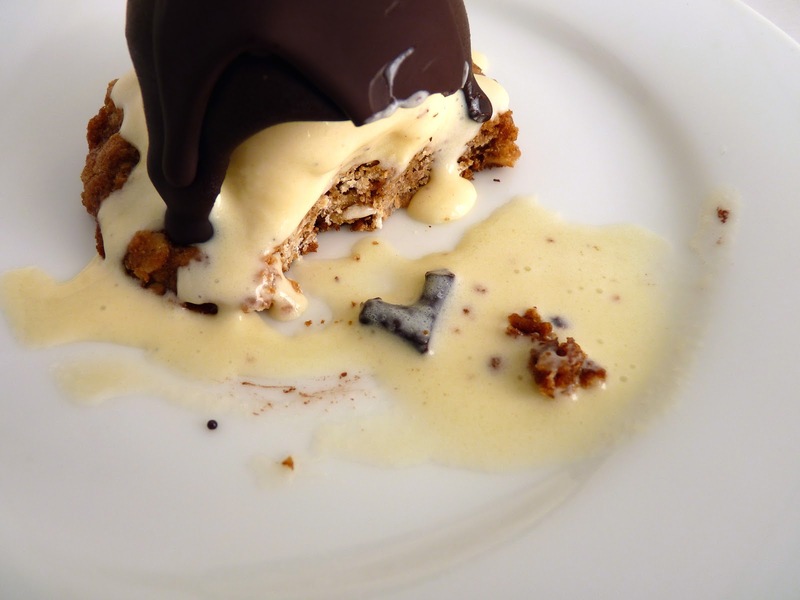 If you prefer a more gooey effect, try a simple Chocolate Sauce. Preheat oven to 375 degrees. Prepare two baking sheets with parchment or silpats. Whisk together flour, baking soda, cinnamon, salt and nutmeg and oats. Beat butter and sugars until creamy. Add egg one at a time and mix until thoroughly blended. Add vanilla. Add the flour and oat mixture and mix just until blended. Divide dough into about 12 portions, form into a ball and place 6 on each prepared baking sheet. Press down with your palm of your hand to flatten the tops slightly. Bake 8 to 10 minutes or until light golden brown. Cool 1 minute on cookie sheets; remove to wire rack. Cool completely. Store in an airtight container. Heat milk, salt and sugar in a saucepan to a low simmer. Split the vanilla bean lengthwise with a paring knife, scrape the seeds into the milk and add bean pod. Remove from heat, cover and infuse for one hour. Pour the cream into a medium bowl and set a strainer over the top. Reheat the milk until warm to the touch. Gradually pour some of the milk into the yolks, whisking constantly as you pour. Return the warmed yolks and milk back into the saucepan. Cook over low heat, stirring constantly and scraping the bottom of the pan with a heat-resistant spatula until the custard thickens enough to coat the spatula, leaving a clear track when you run your finger through it. Take off heat immediately and strain the custard into the heavy cream. Whisk the mixture to blend thoroughly and to cool. Add vanilla extract. Refrigerate to chill thoroughly, preferably overnight. Remove the vanilla bean and freeze in your ice cream maker according to manufacturer’s instructions. Pour into clean airtight container, press a piece of plastic into the surface, cover and place in your freezer to firm up. Set a metal bowl over a pan of slowly simmering water, making sure that the bottom of the bowl is not touching the water. Place the chopped chocolate in the bowl along with the canola oil. Whisk gently as it melts. Take off the heat and cool to lukewarm. Pour over ice cream. The chocolate will harden into a shell within a minute or so. Winter arrived yesterday in the form of a nice downpour with more expected to follow. Time to bake some old fashioned comfort food, which at this time of year usually means apples and spice in the form of a spoon dessert. This is one of those crazy self-saucing cakes that sort of defies logic. There’s a layer of fruit on the bottom, a layer of cake batter and then a layer of liquid poured on top. 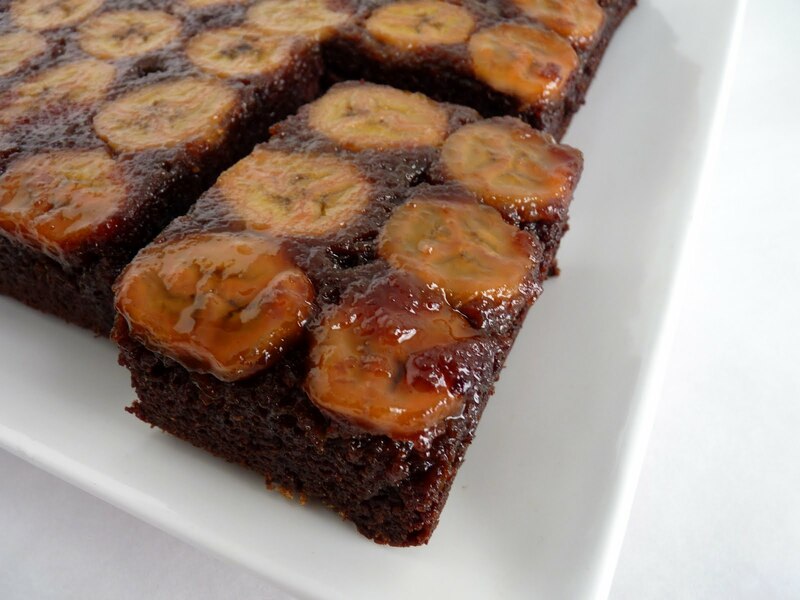 Somehow, this strange arrangement magically bakes into a cake with a nice sauce that simmers the fruit. Fairly odd, but just the thing to enhance a rainy day. 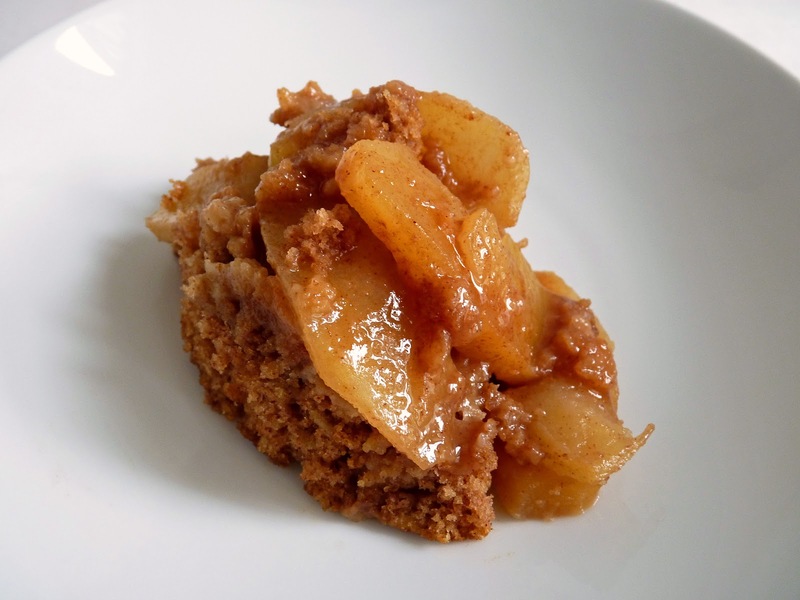 Brown sugar, cinnamon and nutmeg add to the warmth of the dish in each layer. And since I’m a fiend for oatmeal, I tossed just a smidgeon into the cake mix for more texture and taste. Apple cider that’s been simmered with more cinnamon and brown sugar gets poured over the whole thing. Just 30 minutes later you have a soothing warm dessert. And a kitchen full of the very best aromas of winter. - I used Gala apples, which aren’t very sweet. Fujis or Granny Smith would also be good. Adjust for sugar. - If you’re not a fan of oatmeal, just delete it. I’d be tempted to add ground pecans. - Have the cider, brown sugar and cinnamon ready in a saucepan. Once the cake batter is mixed, work quickly to heat the cider mixture, pour it on and get it in the oven. - Use unsweetened apple cider. - This is a great dessert all by itself but of course lends well to serving with ice cream or a dollop of fresh cream. Preheat the oven to 350 degrees. Lightly grease the sides of an 8” x 8” baking dish. Peel and core apples. Cut into thin slices and place in a bowl. Toss with lemon juice, 1 tablespoon of sugar and a pinch of cinnamon. Set aside. For the cake batter, whisk together the flour, oats, baking powder, baking soda, salt, cinnamon, nutmeg and brown sugar until completely combined. In another bowl, whisk together the milk, melted butter, vanilla and egg until thoroughly blended. Using a fork, stir the flour mixture into the liquid until just incorporated and there are no dry streaks. Toss the apples and spread them in an even layer in the prepared pan. Carefully spread the cake batter evenly on top of the apples, fully extending the batter to the edges and corners of the pan. Combine cider, 1/4 cup brown sugar and 1/2 teaspoon cinnamon and bring it to a boil, stirring to dissolve. Remove from heat and pour over the cake batter. Do not stir or attempt to mix the liquid into the batter in any way. Bake for about 30 minutes or until a toothpick comes out with a few moist crumbs. Place the cake on a wire rack for just a few minutes to rest. Serve warm. If you’ve ever eaten bananas with chocolate - ah, yes, there's the old-fashioned Banana Split - you know they are the best of friends. And since I had a couple of bananas on my kitchen table calling out to me, I thought I’d pair them up with a simple chocolate cake. 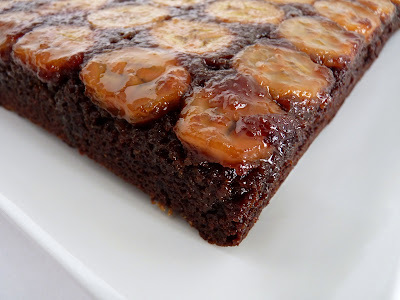 And to make matters more inviting, it also seemed like a good idea to slice and bake the bananas into the cake with a butter and brown sugar caramel. The cake is made with cake flour for tenderness, cocoa powder for rich chocolate depth and a pinch of cinnamon for a slight taste of spice. 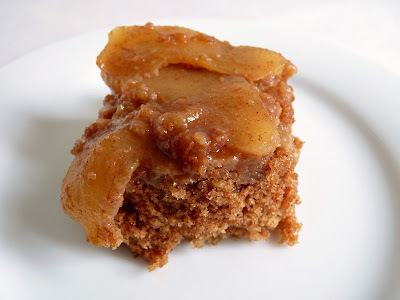 It’s an oil-based cake with a good ratio of brown sugar so it will stay moist if you happen to have leftovers. 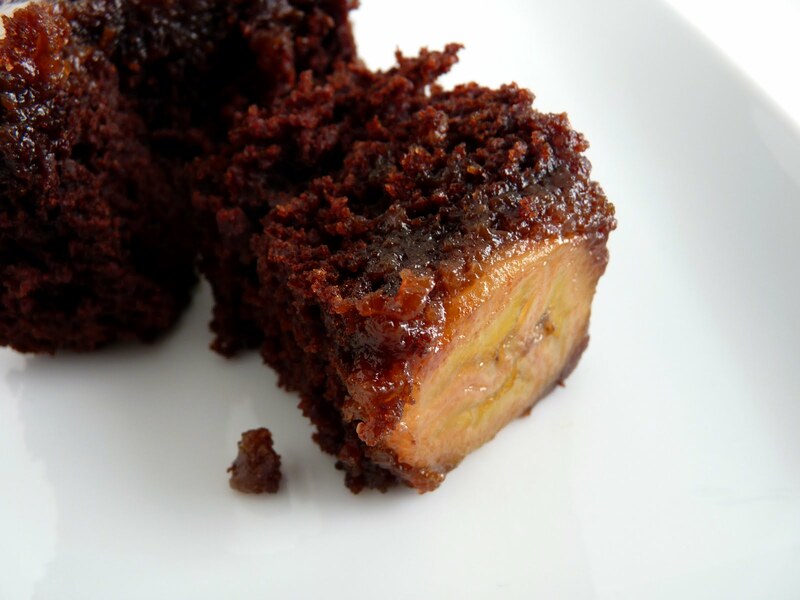 Needless to say, this cake satisfies a winter urge for chocolate and the gooey caramelized bananas are the crowning touch. 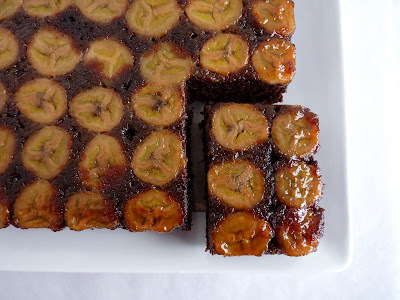 If you're like me and hate to see good fruit ripen without a plan, put your bananas to work in this simple dessert. - The cocoa powder is "bloomed" in hot water to intensify and deepen the flavor. You can substitute hot coffee if you'd like. - Let the cake cool in the pan for about 15 minutes and then turn it out. It should still be fairly warm so when you turn it upside down to remove it the topping doesn’t stick to the bottom. I place a platter on top of the pan, invert quickly and then while still holding the plate and cake pan, give them a firm tap on the counter top. Voila! - I think this tastes even better the next day. - For something a bit fancier, serve with a scoop of vanilla, cinnamon or caramel ice cream. Preheat the oven to 350 degrees. Lightly grease the sides of a 9-inch square pan. For the topping, melt the butter in a saucepan. Whisk in the brown sugar and cook for a minute until blended. Scrape the mixture into the prepared pan and distribute it evenly across the entire bottom of the pan. Slice the bananas about 1/4” thick and arrange on top of the butter sugar mixture. Set aside. Sift the flour, baking soda, salt and cinnamon. Whisk together the cocoa powder and hot water until thoroughly blended and smooth. Mix the buttermilk and vanilla extract. Combine the oil, granulated sugar and brown sugar in a large bowl. The mixture will look like wet sand. Add the eggs and blend well. Whisk in the cocoa mixture. Stir in the dry ingredients in 3 additions, alternating with the buttermilk and beginning and ending with the dry ingredients. Mix just until well blended. Pour into the prepared pan over the bananas and gently tap the bottom of the pan on the work surface a few times to remove any air bubbles. Bake for about 33 - 35 minutes or until a toothpick tests with a few moist crumbs adhering. Cool 15 minutes. Run a thin bladed knife around the edges. Place a platter over the cake and invert. Cool completely. Here we are in the midst of winter and I’m dreaming about blueberries. So when I saw them at the market, I impulsively grabbed them for purchase. They’re not in season but I couldn’t resist. Blueberries just have their way. With all the hubbub and festivity of the holidays behind us, it feels like a good time to get way back to the basics, so here I am with a Blueberry Slump. 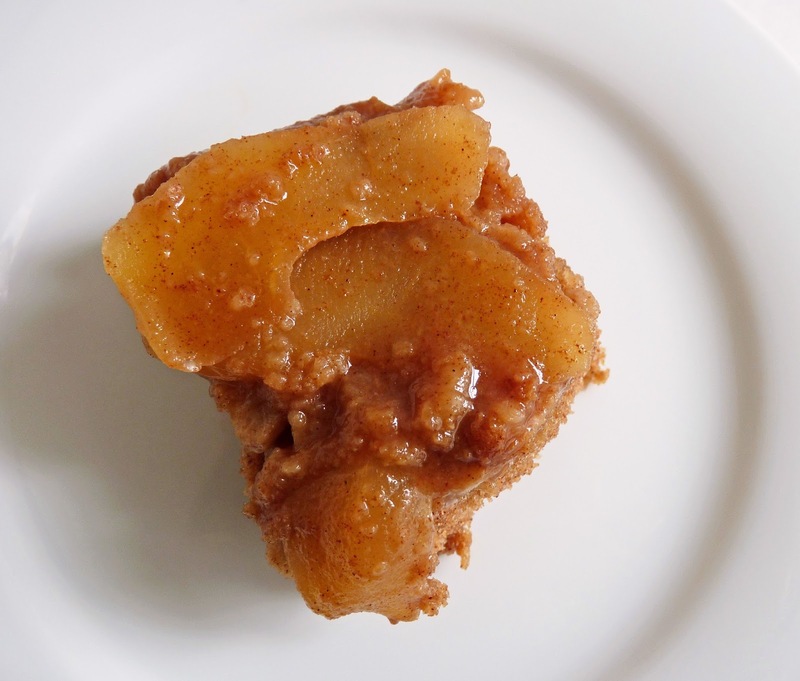 There are a lot of different old-fashioned recipes for fruit puddings and cakes that vary in the way the fruit and cake parts are co-mingled. 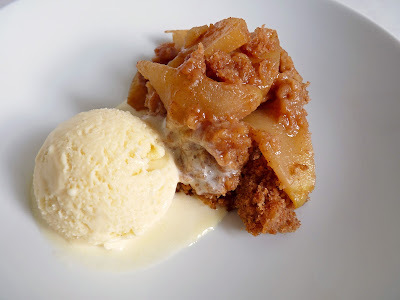 A slump is somewhere in the same universe as a cobbler and a buckle, a sort of dumpling-cake-like pudding, which in the old days was steamed on top of the stove. This dessert is a happy combination of blueberries and bits of cake that get baked in the oven and emerge in a marbled swirl of light cake and juicy fruit. 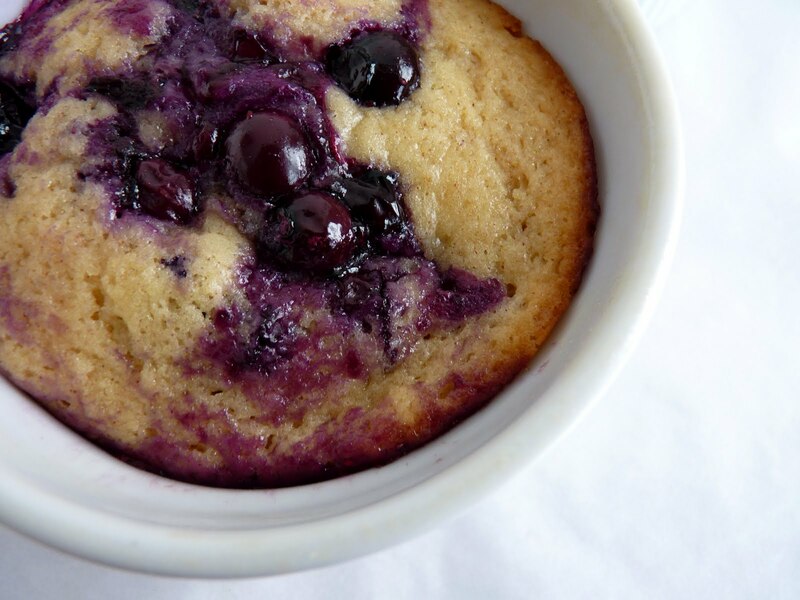 The blueberries are simmered with some sugar just enough to coax out their inky jammy goodness. Then a good blast of lemon juice is added to keep the flavor bright. The cake is made with brown sugar and a jolt of cinnamon to make it all the more interesting. Once baked it really does seem to kind of all slump together, a welcome blueberry feast in January. - The sugar added to the blueberries is kept at a minimum to allow the fruit to shine. Add more sugar if you prefer a sweeter taste. - I used cinnamon. I imagine other spices would work as well. I think cardamom would be great. 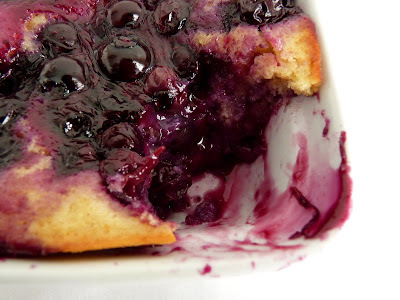 - The blueberry mixture, including juices, gets layered under and on top of batter. As it bakes, the cake rises and dances with the blueberries in an interesting way. - You can make 4 large servings or 5 - 6 more modest servings. Watch baking time. Or bake in an 8" x 8" pan, which will take a bit longer. You'll know it's done when the fruit is bubbling and the cake springs back when lightly touched. - This is really best served warm. - I think this would be great with just about any sort of fruit. Adjust sugar and cornstarch accordingly, e.g., figs would probably not need any cornstarch and peaches might not need as much sugar. Preheat oven to 350 degrees. Lightly butter 4 - 6 4 1/2” ramekins, depending on desired serving size. Place on a baking sheet. For the blueberries, combine 1/4 cup sugar, 1/4 cup water and cornstarch in a saucepan and bring to a boil, stirring to dissolve. Add blueberries and simmer over medium low heat, stirring occasionally, for about 3 – 4 minutes or until the blueberries soften and release their juices. Take off the heat and add lemon juice. Set aside. Whisk together flour, baking powder, cinnamon, salt and light brown sugar. In a separate bowl, whisk buttermilk, egg, melted butter and vanilla. Add flour mixture and whisk just until blended. 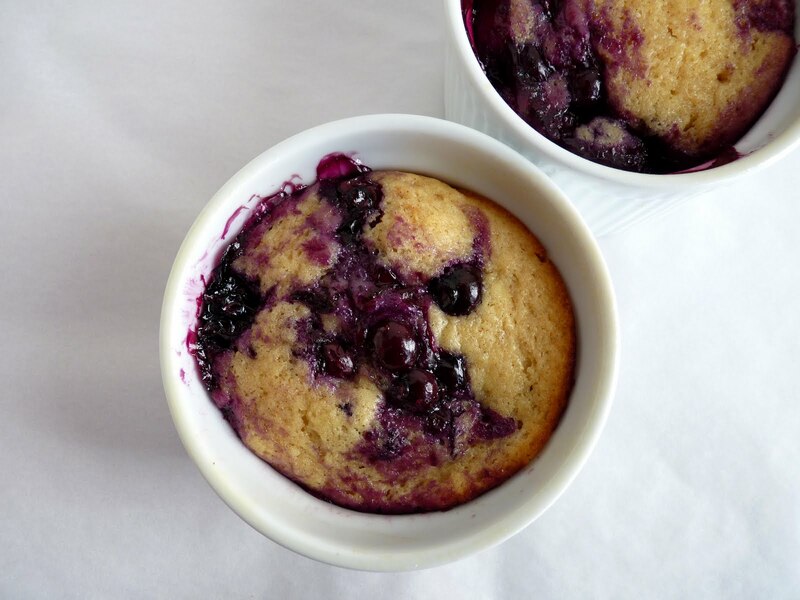 Scoop a heaping tablespoon of blueberries into the bottom of each ramekin. Portion batter on top. 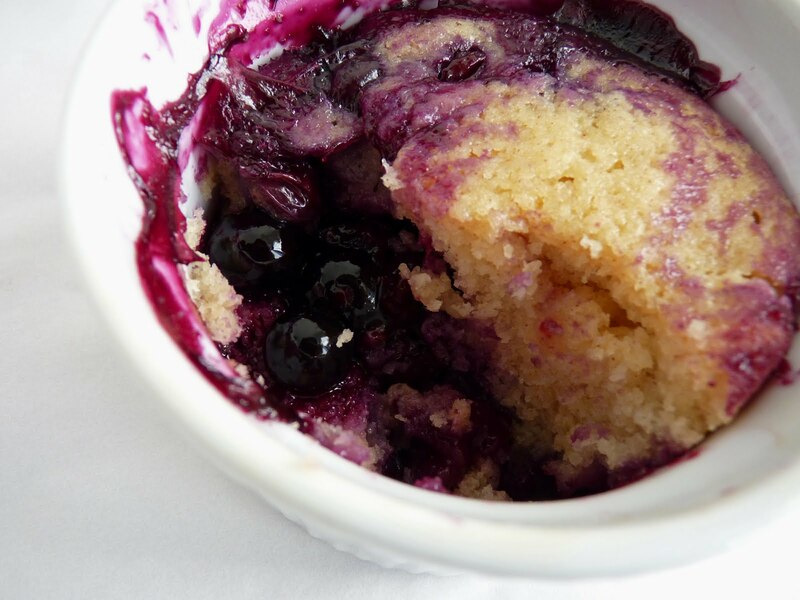 Spoon remaining blueberry sauce over batter. Bake for about 20 – 24 minutes or until a tester comes out clean. Serve warm.